Cox Automotive Industry Update Report: January 2019 - Cox Automotive Inc.
Economic Indicators: Wages and incomes continue to grow faster than prices, so consumer spending power continues to improve. However, the fact that higher wage growth is trickling into higher core prices means that the more hawkish members of the Federal Reserve Open Market Committee have reason to push for higher interest rates. Demand: December new vehicle sales were up 1.5% YOY, with the same number of selling days compared to December 2017. The December SAAR came in at 17.5 million, up versus last year’s 17.3 million. Cars continue to see sharp declines, as sales in December fell 10% compared to last year. Light trucks outperformed cars in December and were up 6% YOY. New vehicle sales in 2018 increased 0.5% versus the prior year to 17.2 million vehicles, the fourth consecutive year of sales exceeding 17 million units. 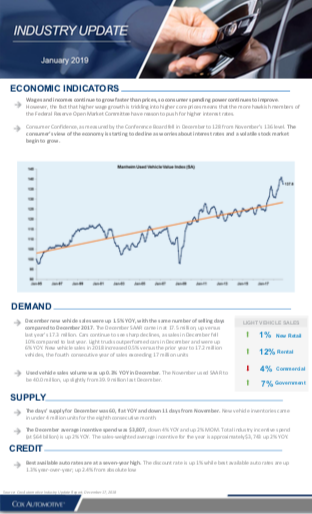 Supply: The days’ supply for December was 60, flat YOY and down 11 days from November. New vehicle inventories came in under 4 million units for the eighth consecutive month. The January 2019 Cox Automotive Industry Update Report shares Cox Automotive’s multifaceted insight into the automotive marketplace to provide an overview of economic indicators, supply, demand, credit and other vital topics and trends affecting the industry. Wages and incomes continue to grow faster than prices, so consumer spending power continues to improve. However, the fact that higher wage growth is trickling into higher core prices means that the more hawkish members of the Federal Reserve Open Market Committee have reason to push for higher interest rates. Consumer Confidence, as measured by the Conference Board fell in December to 128 from November’s 136 level. The consumer’s view of the economy is starting to decline as worries about interest rates and a volatile stock market begin to grow. December new vehicle sales were up 1.5% YOY, with the same number of selling days compared to December 2017. The December SAAR came in at 17.5 million, up versus last year’s 17.3 million. Cars continue to see sharp declines, as sales in December fell 10% compared to last year. Light trucks outperformed cars in December and were up 6% YOY. New vehicle sales in 2018 increased 0.5% versus the prior year to 17.2 million vehicles, the fourth consecutive year of sales exceeding 17 million units. Used vehicle sales volume was up 0.3% YOY in December. The November used SAAR to be 40.0 million, up slightly from 39.9 million last December. The days’ supply for December was 60, flat YOY and down 11 days from November. New vehicle inventories came in under 4 million units for the eighth consecutive month. The December average incentive spend was $3,807, down 4% YOY and up 2% MOM. Total industry incentive spend (at $64 billion) is up 2% YOY. The sales-weighted average incentive for the year is approximately $3,743 up 2% YOY. Best available auto rates are at a seven-year high. The discount rate is up 1% while best available auto rates are up 1.3% year-over-year; up 2.4% from absolute low.